Free download GWX Control Panel latest version. Download the new version of GWX Control Panel from high speed direct download link for your computer or laptop. This program is absolutely free. This is a free tool that can remove and disable the ‘Get Windows 10’ notification area icon on Windows 7 and Windows 8. Newer versions can also disable ‘Upgrade to Windows 10’ behavior in the Windows Update control panel. See the user guide at the Ultimate Outsider blog. 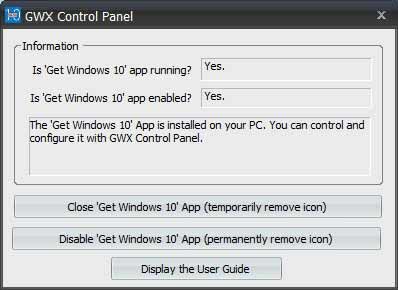 GWX Control Panel (previously named GWX Stopper) is a free program that you can use to configure and exit the “Get Windows 10” system tray application which continually pops up on PCs that are still running Windows 7 and Windows 8. It can also prevent unintentional Windows 10 upgrades from occurring via Windows Update. GWX Control Panel really works, is safe and easy to use, and gives you the option to re-enable the icon and upgrade notifications if you’re ever ready to move forward with Windows 10.